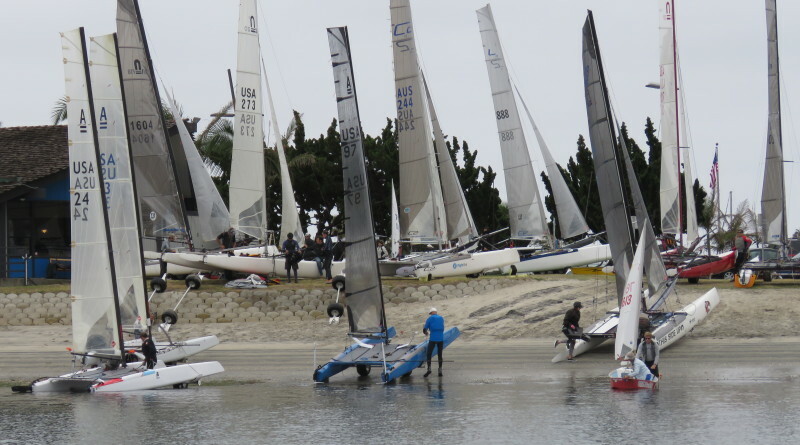 Mission Bay Yacht Club recently hosted Cat Fight 2, the largest gathering of high-performance catamarans on the West Coast. SAN DIEGO — Twenty-seven boats hit the open ocean last month to compete in Cat Fight 2, the largest gathering of high-performance catamarans on the West Coast since the 2012 F18 World Championships. 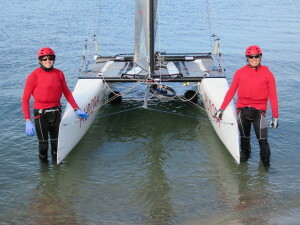 Mission Bay Yacht Club hosted the two-day race split into two starts and featured six races. The spinnaker fleet had 19 boats and A-Cats had eight boats. Weather ranged from light and bumpy on May 14 to ideal with 12-15 knots on May 15. Steve Stroebel and Brain Paine defended their title as overall 2016 Cat Fight 2 Champions along with Matt Morris, who was part of the crew. The race was Morris’ first race back after experiencing a seizure that resulted in him undergoing brain surgery in 2015. “It was so awesome to have Matt full strength back on the boat, right where he was a year ago before his brain surgery,” said Stroebel. Morris is equally fond of Stroebel. Steve Cooper was only able to race his Nacra 20 on May 14 but he had an excellent day on the water with crew Emily Allina. “The winds were light and uneven, so finding the elusive veins of wind on the course was critical,” said Cooper. Cooper and Allina crossed the finish line second, but corrected into fourth place. The current F18 National Master’s Champion Scott Miller enjoyed surfing the waves downwind in the good breeze. Miller’s least favorite moment was hitting the windward mark, not once, but twice. On Race 2, a capsized outrigger canoe on the course distracted Miller when he realized his fleet was in their starting sequence. Miller launched his kite and accelerated towards the line pulling off a decent start navigating through 18 other cats with his chute up. Miller and his wife Patty’s skills overcame those few mistakes and Team Miller took an overall third place in the regatta. Kevan Peck and his crew Cole Baker on the Nacra 20 Carbon stayed on the outside to keep clear off the kelp, and it paid off. Peck had to drop out of racing on May 14 with boat problems, but came back strong on May 15 with four bullets. Chuck Peinado and his crew Daniel sailed earned second place in the Spin 20 Fleet. The Mission Bay YC cat fleet has recently drawn top sailing rock stars like Bill Hardesty, Bryan Paine, Scott Hoffman and Tyler Caroe. Hardesty is a professional sailor who has won a dozen world titles on various boats and he recently bought an F18 to race with his wife Mandi. Bryan Paine is a former Olympic-level sailing coach who just moved to San Diego to work for Ullman Sails. Hoffman has been racing for over a decade and is jumping back into catamaran sailing after an Olympic Finn Campaign. Complete Cat Fight 2 race results can be found at tinyurl.com/Cat-Fight-II. —Cherie Sogsti contributed to this report.